Gardening is often categorised as a battle: man / woman versus nature, humans creating order from chaos, trying to impose our desire and wishes on an artificial landscape of our making. We want things to be ‘just right’, and so we design planting schemes in our heads or draw up plans for what we feel will look great and achieve our aims. But, just like a fast-moving video game there are challenges at every turn. And as the weather warms, we need to be fighting fit and prepared to maintain our garden dreams. So, top of our thoughts after a few mild days, and with bulb shoots pushing up out of the ground, are weeds and how we will keep on top of them. But, there’s no such thing as weeds – they are simply plants growing where they are not wanted. It’s all about perception. To some, a lawn covered with Daisies is a delight, to others, an affront. But let’s get sensible. If we want our plots to be neat and tidy, as many gardeners do, we need a strategy to achieve a weed-free garden. To develop one we need to understand why weeds do so well. They have a number of their own successful strategies for spreading. For example, Cardamine (commonly known as Hairy Bittercress, above) forms a fruit which explodes on maturity dispersing up to 50,000 seeds which can travel up to several metres. Other seeds such as dandelions are designed for flight so that they can be blown by the wind far distances. Many weed species are extremely tough – Ragwort and Senecio can complete their life cycles even when uprooted. Weeds can be prolific when it comes to seed production – Rosebay (also known as Willowherb) can produce up to 80,000 seeds per plant! And others such as Convolvulus (Bindweed) and Scutch can regrow if even minuscule pieces of root are left behind. Some, like Annual Meadow-grass, have the ability to germinate most of the year, while others can compress their life cycles in late summer into a few weeks. Another crafty method used by weeds to conquer lawns is compact rosette growth: growing so low to the ground that the lawnmower will keep missing it. There are also opportunists. Soleirolia (Mind Your Own Business) and Veronica (Speedwell) were initially introduced to our garden as ornamentals for the Victorian rock garden, but today they are considered invasive by many gardeners. Weeds compete with cultivated plants for light, nutrients, water and space, and they harbour and spread pests and disease. So what are the best methods to control them? First, identify what you are dealing with – is it an annual or perennial? With annuals you want to minimise the production of seed, i.e. get rid of them before they set seed, while or before they start flowering. Common annual weeds in our gardens include Chickweed, Nettles, Hairy Bittercress, Groundsel (below left) and Annual Meadow-grass. The quickest method is to use a hoe but go easy – tiny annual seedlings only need a light touch to be felled. Once their roots come to the surface, they become desiccated. The more vigorous you are, the more you are breaking down valuable soil structure and if you disturb the soil too much, there is a danger of exposing buried seeds to light. If you are preparing a bed for planting, you can use the stale seed bed method. You leave the prepared ground bare for 10 days allowing weeds to germinate. Spray with a contact herbicide – this works quickly killing foliage it comes in contact with within a day or so. With perennial weeds such as Creeping Buttercup (above right), Daisies and Dandelions, you need to get to the root of the problem – which means digging the whole thing out. This can prove difficult with plants like Dandelions which have long tap roots. Some of the most invasive and difficult to eradicate weeds are perennials, eg Bindweeds, Horsetail, Ground Elder and Japanese Knotweed. You need to dig these out but they will keep popping back – you just have to persist. You can also use a systemic herbicide that will penetrate down to the roots. This takes longer to work than the contact herbicides as it is absorbed via the sap throughout the plant down to the roots, but will kill off the whole plant. Be careful when using sprays – on a windy day they will blow right over your precious plants, so always choose a still day. But what if the weed is crawling right through your border full of plants? One method is to train Bindweed to climb up bamboo canes and then when it is in flower, apply the weedkiller. Mulches are a good method of weed suppression but they need to be thick to do the job properly (4- to 6-inches) and you need to have ensured that your soil is weed-free before applying. Bark is a good option here, the coarser the better so seedlings can’t germinate on top. 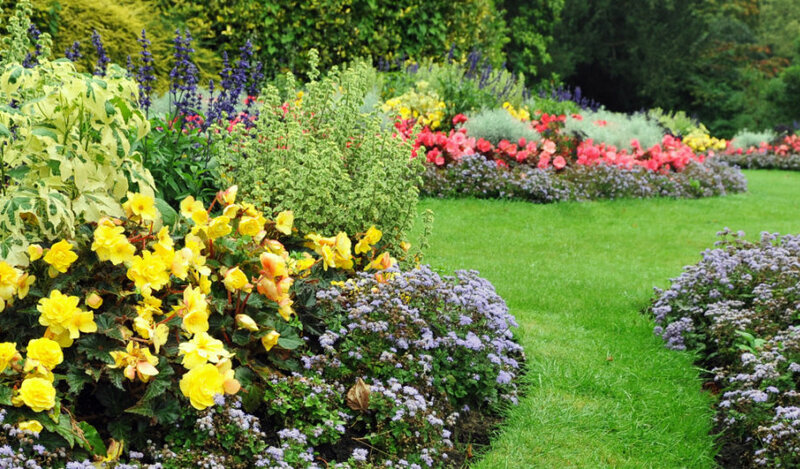 We specialise in total garden solutions in the Dublin area. Lavin Landscape & Ground Maintenance offers a range of services for commercial and domestic customers. Including lawn mowing, hedge maintenance and trimming, weeding and garden upkeep, planting and green waste removal. For all your garden needs, we have it covered!